the first stage of the general adaptation syndrome; the response of the sympathetic nervous system to either physical stress or a strong emotional state (see also stress reaction). It is an automatic and instantaneous response that increases the body's capability to cope with a sudden emergency. The physiologic changes that occur increase physical strength and mental activity. The blood pressure is elevated, the blood glucose level is raised for additional energy, the blood coagulates more readily, and the flow of blood to muscles needed for activity is increased, while those organs not needed for “fight” or “flight” receive a diminished blood supply. One of the most striking manifestations of this reaction is the involution of lymphoid tissues due to the action of adrenal hormones. Called also sympathetic stress reaction and fight-or-flight reaction. the various phenomena, for example, stimulated endocrine activity, that the body exhibits as an adaptive response to injury or stress; first phase of the general adaptation syndrome. Compare: fight or flight response. The initial stage in the body's response to stressful stimuli, characterized by adaptive physiological changes, such as increased hormonal activity and increased heart rate. the first stage of the general adaptation syndrome. 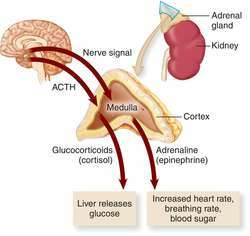 It is characterized by the release of adrenocorticotropic hormone (ACTH) by the pituitary gland and of epinephrine by the adrenal medulla, which cause increased blood glucose levels and a faster respiration rate, increasing the oxygen level of the blood. These actions provide the body with increased energy for dealing with stress. The various phenomena (e.g., stimulated endocrine activity) the body exhibits as an adaptive response to injury or stress; first phase of the general adaptation syndrome. the response of the sympathetic nervous system either to physical stress or to a strong emotional state. Called also stress reaction and fight or flight reaction. It is an automatic and instantaneous response that increases the body's capability to cope with a sudden emergency. The physiological changes occurring during this reaction increase physical strength and mental activity. The blood pressure is elevated, the blood glucose level is raised for additional energy, the blood coagulates more readily, and the flow of blood to muscles needed for activity is increased, while those organs not needed for fight or flight receive a diminished blood supply. One of the most striking manifestations of this reaction is the involution of lymphoid tissues due to the action of adrenal hormones. Q. is there cause for alarm if i have a white thick discharge? A. Hello, ruffdee, if the discharge is white, and NOT causing any itchy feeling, burn sensation, and not smelly, it probably still is in normal range. But once you feel itchy, burning, its color turns yellowish or greenish, and it has bad smell, it might be a sign for an infection, and it is recommended then you to find a doctor to get the specific therapy to cure the infection. Q. I wish to know the alarming signs in pregnancy that require immediate attention. I am pregnant and in my 2 week. As a precautionary measure, I wish to know the alarming signs in pregnancy that require immediate attention. A. here are some major ones- Vaginal Bleeding, Cramping (in the second and third trimester, in the first it's normal to have slight cramps), Severe Headaches (long lasting headaches are one of the early signs of preeclampsia), Blurred Vision (another sign of preeclampsia),cannot feel the baby move after about week 16 to 20 pregnancy. Q. How do you wake up in the morning if your narcolepsy is so severe you can't hear the alarm clock, phone ring? biggest problem is sleep paralysis, can't wake up. Late for work, everything, life is suffering because of severity. Have tried ritalin, natural supplements, hypnosis therapy, Provigal, antidepressants, nothing seems to work. Employer thinks it's an excuse, friends are irritated, I'm at my wits end. Life is spent sleeping more than awake. A. Narcolepsy cannot yet be cured. But EDS and cataplexy, the most disabling symptoms of the disorder, can be controlled in most patients with drug treatment. Often the treatment regimen is modified as symptoms change. For decades, doctors have used central nervous system stimulants-amphetamines such as methylphenidate, dextroamphetamine, methamphetamine, and pemoline-to alleviate EDS and reduce the incidence of sleep attacks. For most patients these medications are generally quite effective at reducing daytime drowsiness and improving levels of alertness. However, they are associated with a wide array of undesirable side effects so their use must be carefully monitored. Common side effects include irritability and nervousness, shakiness, disturbances in heart rhythm, stomach upset, nighttime sleep disruption, and anorexia. For full article: http://www.ninds.nih.gov/disorders/narcolepsy/detail_narcolepsy.htm#120393201 Hope this helps. When the alarm reaction is not sufficient to cope, the stressor maintains its attack. The various phases of body alarm reaction that have been discussed over the years such as tunnel vision, slow motion movement, loss of digital dexterity and the like, were all recalled by the subjects interviewed. The 13 papers in this collection describe such fish olfaction topics as the development and evolution of the olfactory organ in Gnathostome fish, responses to amino acids in rainbow trout, olfactory discrimination, recordings of stimulated goldfish, cross-adaptation, alarm reactions, solitary chemosensory cells, the Barbel taste system in catfish and goatfish, taste bud cells and their behavior, the role of gustation in comparisons of species based on volumetric brain data, and taste tests for the nine-spined stickleback from the Moscow River and White Sea basins.